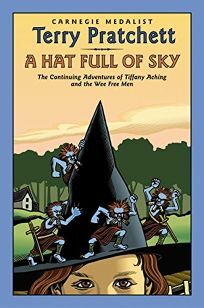 Terry Pratchett follows up his The Wee Free Men (which PW called ""an enthralling and rewarding read"" in a starred review) with A Hat Full of Sky, starring the young witch Tiffany Aching. Tiffany leaves home and the little blue Nac Mac Feegle to apprentice for Miss Level. Meanwhile, Tiffany, some powerful witches and the little blue fairies must defeat the hiver that stalks her.